• Animate Using Animation Tools: By default, a drawing layer can be animated, but Toon Boom Harmony gives you the ability to disable this feature. Being able to switch your drawings so they can no longer be animated without a peg has certain advantages. It means that you can have access to the drawing substitution feature for this drawing layer, while being able to create keyframes on its parent peg. This feature is also available for backward compatibility when bringing in templates created in older versions of the software, so as not to lose their offset keyframes or drawing substitution keyframes. 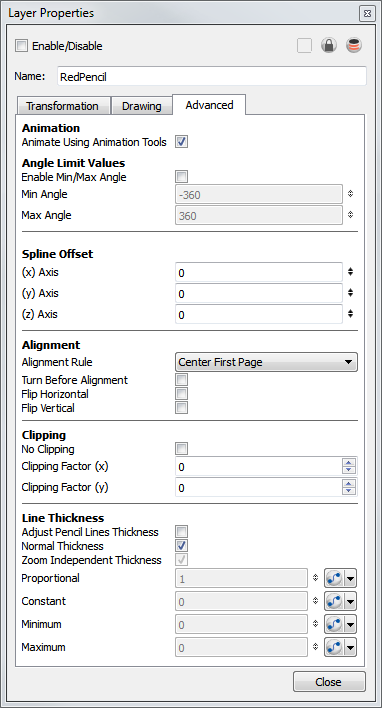 • Alignment Rule: The alignment rule selections are intended to deal with drawings that were created on paper of a different size or orientation from the default alignment rule (set up in the Scene Setting dialog box). If you select Turn Before Alignment, the drawings are rotated and then scaled, based on the option selected from the drop-down list. The drawings are then scaled to match Toon Boom Harmony alignment rectangle. • Left: The default alignment for drawings; aligns the drawings on the left side of the scene’s alignment rectangle. Toon Boom Harmony scales the drawings to match their height to the alignment rectangle of the scene. • Right: Aligns the drawings on the right side of the alignment rectangle. Toon Boom Harmony scales the drawings to match their height to the height of the alignment rectangle of the scene. • Top: Aligns the drawings on the top of the alignment rectangle. Toon Boom Harmony scales the drawings to match their widths to the width of the alignment rectangle of the scene. • Bottom: Aligns the drawings on the bottom of the alignment rectangle. Toon Boom Harmony scales the drawings to match their widths to the width of the alignment rectangle of the scene. • Centre LR: Aligns the drawings in the left-right centre of the alignment rectangle. Toon Boom Harmony scales the drawings to match their height to the height of the alignment rectangle of the scene. • Centre TB: Aligns the drawings in the top-bottom centre of the alignment rectangle. Toon Boom Harmony scales the drawings to match their widths to the width of the alignment rectangle of the scene.